President John Agyekum Kufuor, the African Union Chairman, has called on Sudan to work closely with the United Nations (UN) to end the crisis in the Darfur region. Sudan has been resisting attempts by the world body to send in peacekeepers to the troubled Darfur region. 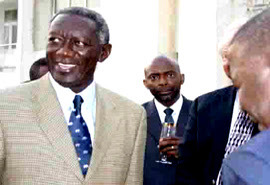 President Kufuor, who made the call at an end of year reception organised for the Diplomatic Community at the Castle Gardens underscored the need to ensure peaceful approach to conflict management and resolution in the Africa. He said as the Continent was moving away from liberation struggle to economic empowerment, he was determined to use his Chairmanship of the AU to work to tackle weak governance and conflicts. Additionally, Ghana would work with the ECOWAS Commission to promote greater integration. President Kufuor expressed the Nation’s gratitude to the country’s development partners for the support that enabled the Government to remain focussed on its development agenda. He said, through the seven-billion dollars debt cancellation, a lot was being done in the areas of social services and infrastructure to improve the lives of the people. He stated that, with the sustained pace of the country’s current development there was no way it would not be able to achieve its vision of becoming a middle income status and the Millennium Development Goals.